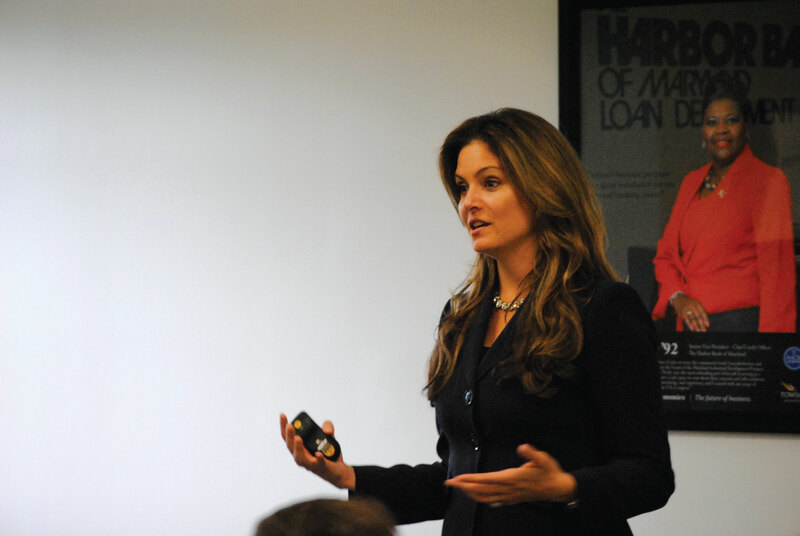 TD Ameritrade Managing Director for Trading Nicole Sherrod spoke to a group of students and faculty about the future of Wall Street and social media on Oct. 29 as a part of the 150th Anniversary Visiting Scholar Speaker Series. The event, hosted in the Auburn House Pavilion, began with comments from Dean of the College of Business and Economics Shohreh Kaynama, and Interim President Timothy Chandler. Sherrod began her speech by describing the passion she has for connecting with today’s youth. Sherrod used her own experiences in finances to connect with the youth within the audience. She told stories about the growth from her first investment in 1997 to her profession with online broker site TD Ameritrade today. “Look at your world a little bit differently,” Sherrod said as she moved into a discussion on the growing social media impact. She specifically mentioned Uggs and Sears as brands that have been significantly negatively affected by social media mentions from their customers. From there, Sherrod moved into a discussion on the various demographics that will play a more significant role on Wall Street in the future, specifically millennials and women. Sherrod described millennials as the next “agents of change,” and said that they will make Wall Street amend the ways business has been carried out in the past. “They [the millennials] care a lot about greed and they [the millennials] don’t like it at all,” Sherrod said. With over 15 years of experience in finance, Sherrod is considered a leading advocate for women and young investors in the financial services industry. Sherrod drove TD Ameritrade’s mobile and platform product development and business growth initiatives within the active trader segment of the business. She is also a leading voice in retail sentiment, technology, and investing trends in business news outlets, as well as a contributor to Yahoo! Finance. The next speaker of the 150th anniversary Visiting Scholar series is University of Iowa associate professor and author Christine Ogren. She will speak about her book, “The American State Normal School: An Instrument of Great Good” at Cook Library Nov. 18 at 6 p.m.